Hitting the road as a family can mean lots of stops, detours, potty breaks, and other distractions that make your road trip take much longer than it needs to. Some stops are inevitable, but even so there are things you can do to keep stop times down and stay on schedule! This post is sponsored by Pilot Flying J, but all opinions are my own. Check Construction Traffic – Along the route, or before you take off, check your planned route to avoid as much construction and traffic as you can. Getting stuck in a bad construction zone can add a long delay to your trip as you crawl through slow or stopped traffic. Plan Your Travel Times – Driving through large cities along your route can lead to lots of traffic. Plan your trip times to avoid the peak hours heading through those major cities and you’ll avoid a lot of unnecessary delays. Prepare Entertainment – Have activities ready for the whole crew. An audio book and movies are a great distraction to kill the time. Or make a fun kit around a theme to keep the kids engaged and entertained. 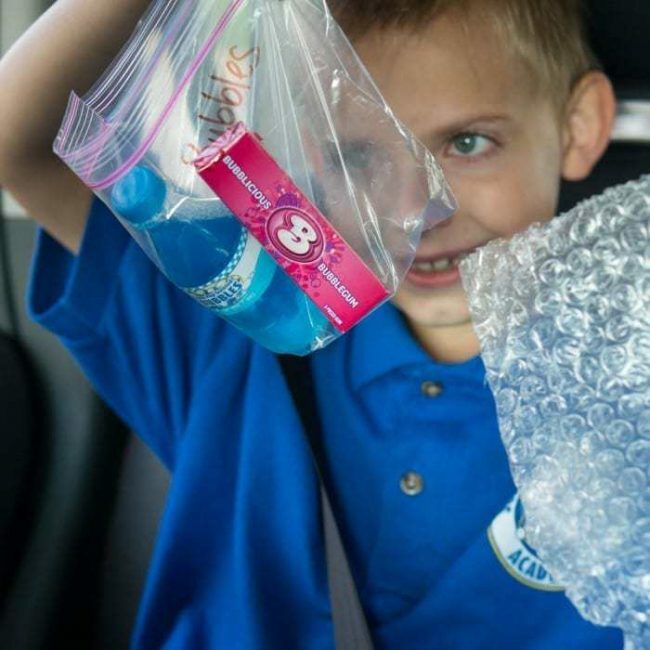 We’ve made a Bubbles Kit that includes Bubble wrap, bubble gum, and mini bubbles. Stash all the goodies in a zipper sandwich bag and tell the kids to keep their trash in the bag to swap out with their next activity kit. 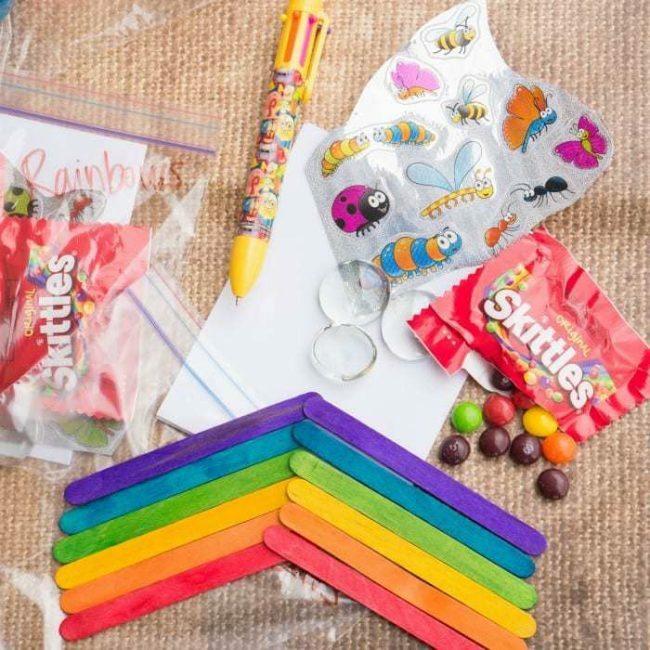 I also made a darling Rainbow Kit with a multi-ink colorful pen, holographic stickers, colorful popsicles sticks to make patterns or design a rainbow, glass gems to reflect light, and a blank sheet of paper to design their own colorful masterpieces. There are tons of possibilities you can create for cute themed kits. Time Your Drinks – Staying hydrated is important, but instead of sipping throughout the drive, gulp down a water bottle and pass the kids back a drink about an hour before you’re next planned stop. You can plan your upcoming stops around refueling and meals to save time. 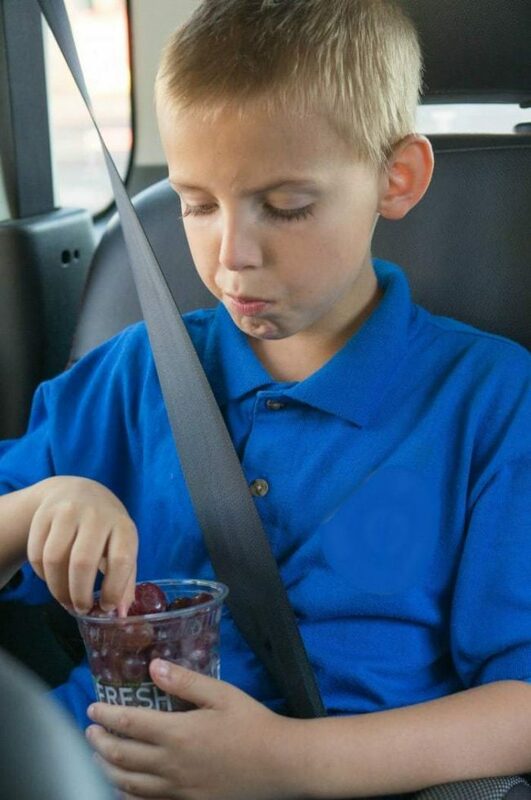 Multitask At Stops – During your road trip, it will be necessary to stop for different needs such as to use the restroom, stretch, refuel, or grab a bite to eat. Lump your stops as much as possible to cut down on your overall stops. When you stop to refuel, for example, let everyone out to have a chance to stretch and grab some snacks to get you through to your next pit stop. We grabbed a cup of fresh grapes at Pilot Flying J’s, as one of their wholesome food options as part of their PJ Fresh Marketplace. They even had hard boiled eggs which is a perfect protein snack that won’t make your stomach upset like junk food will. Use Rest Stops – When someone from your crew needs to use the bathroom between your stops, watch for rest stops. They’re the fastest way to get off and back on the road again. They also offer a nice place to run around for a few minutes and burn some energy before your back in the seat. Dinner on the Go – Meals can take a lot of time if you stop to eat. Grab a bite while filling up your tank at a Pilot Flying J and you’ll be able to tackle two jobs in one stop. 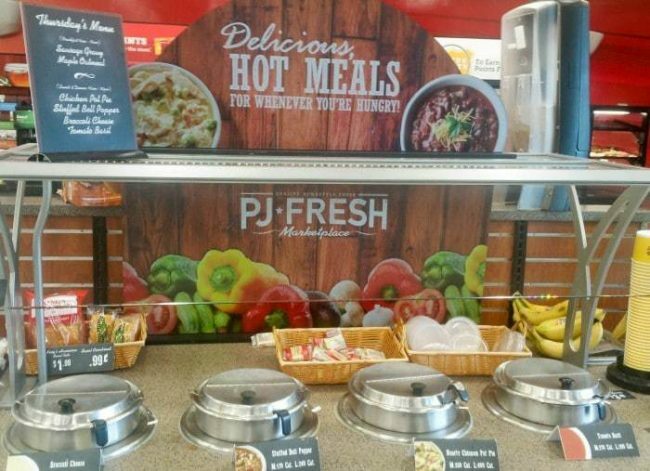 Their PJ Fresh menu includes soups, fresh fruits and vegetables, hot dogs, tamales, sandwiches and salads, roasted chicken and sides, and amazing pizza you literally won’t believe you found at a gas station. 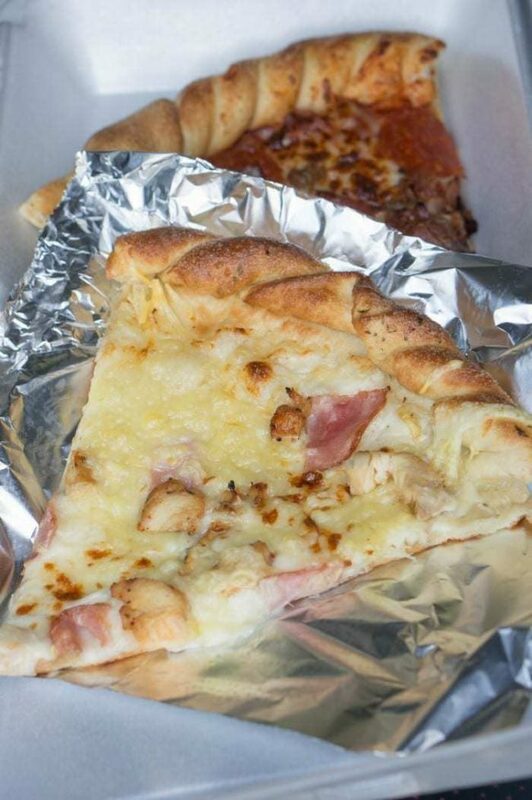 The pizza is ready to order by the slice so you can enjoy this family favorite meal while on the go without wasting time waiting for a pizza to be made. I grabbed a slice of Chicken Cordon Bleu and my son picked Mega Meat. The huge slices feel like a hearty 2 slices. I’ve never had anything like this Chicken Cordon Bleu slice. It was abundant in chicken, sliced ham, and lots and lots of cheese. It had a creamy texture and the crust was so soft it felt like a breadstick. I will be back in to my local Pilot Flying J just to grab a few slices of pizza for my crew, it was worth stopping in for! 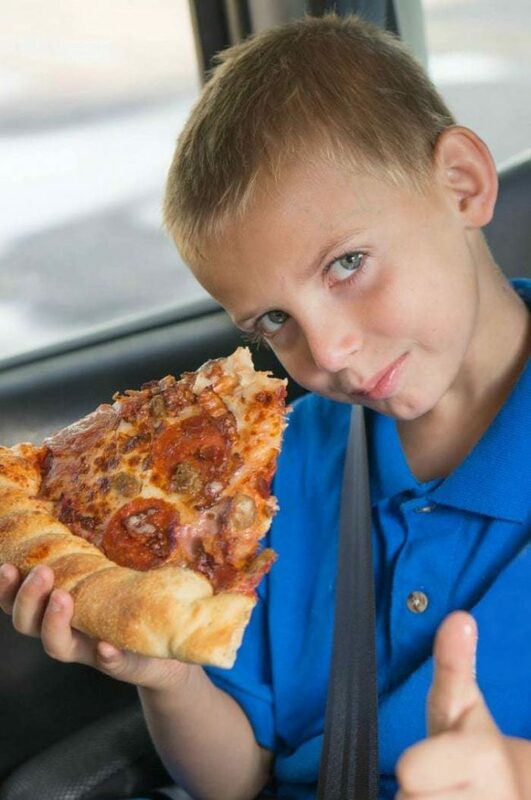 My son loved his Mega Meats slice and kept commenting on how yummy it was. You can see just by this picture how truly massive the slices are! We combined fresh grapes with a yummy slice of pizza and had a very filling meal to keep us on the road. Best of all, the whole stop just took a few minutes, just long enough to pick out our slice, fuel up, hit the restrooms, and be back on the road again. 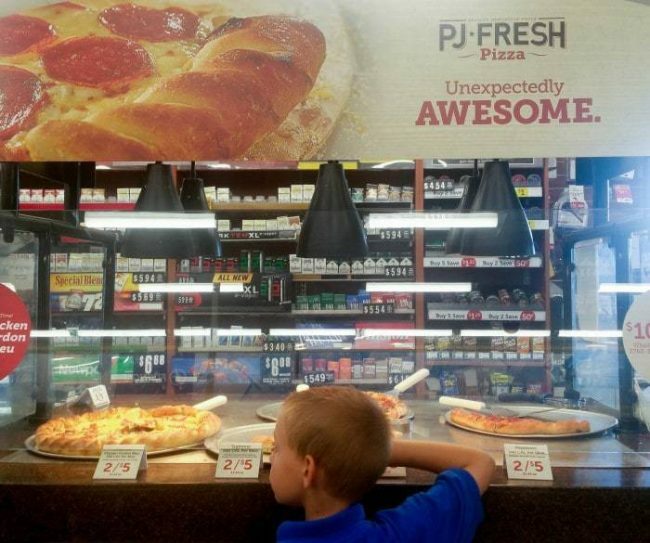 Visit your local Pilot Flying J on your next road trip, or the next time you pass one by, to try their yummy pizza varieties and other options in the PJ Fresh Marketplace. What are your tricks for avoiding delays as you travel? Janel, great tips! I would add that another way to save time is to leave during the wee hours of the morning and put your kids in the car while still in their pajamas. That way, you can get a few hours of the trip under your belt before your kids even wake up! I’ve absolutely done that!! 🙂 My kids don’t stay asleep anymore though, and then they just get cranky. This totally worked when they were little though! Yes please on the pizza! Great ideas. We’re taking our youngest grandkids on a short trip this weekend. Thanks for the awesome tips! Excellent tips! Anything to kill time and keep the kids busy on the road is a bonus! We have a five hour road trip planned for this weekend! I’m so glad I read this post and now will have all my ducks in a row and will have everything I need to keep my kids content while on the road! Entertainment for the kids is everything! Great ideas. Good entertainment is a must for us when we travel with the kids. These are great ideas for road trips!! I love going on them but the kids can get bored fast on them. Those fun kits are a great idea. Kids do become bored so easily on road trips when they have nothing to do. These are all great suggestions. I try to avoid rush hour traffic as much as possible when travelling. What great ways to keep the kids entertained while traveling! 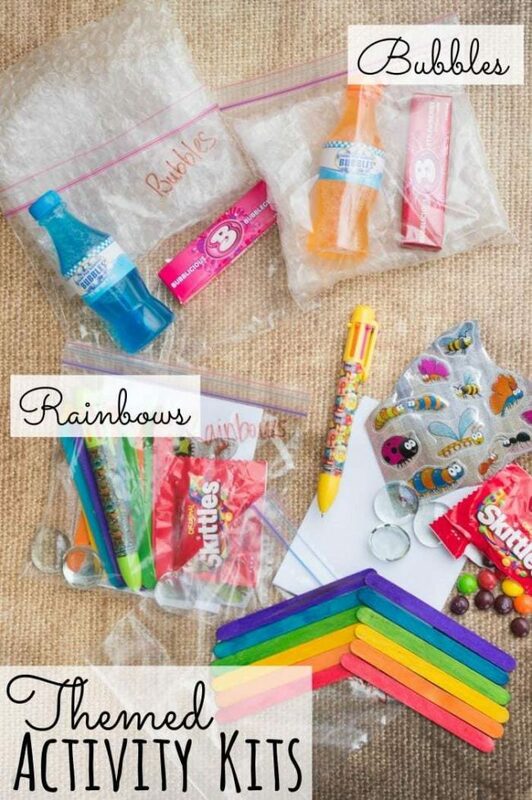 Love the rainbow idea! Hey, who doesn’t like a family road-trip? Thanks for the helpful pointers you list here. I like to pack different games the kids can play in the car. We have a fun licence plate game. I have the hardest time with packing entertainment but it’s a total must! These are really great tips! I have to roll up my sleeves and really get busy with planning on road trips entertainment, though. I always check the route I want to take for construction. There is nothing worse then getting stuck in it. 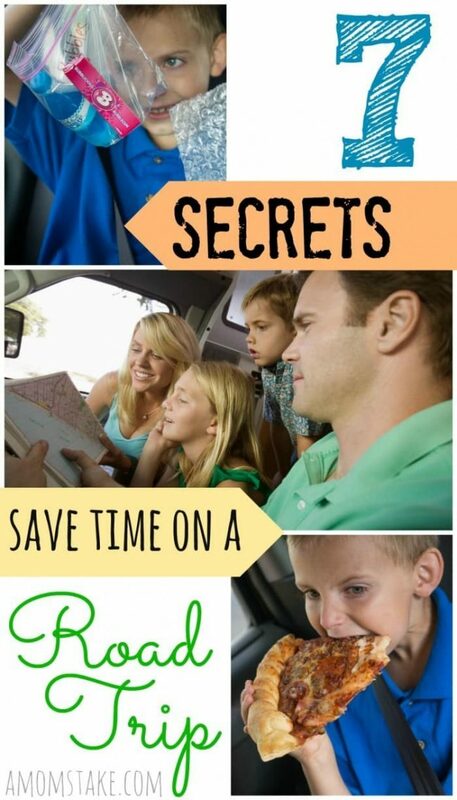 These are great road trip tips. I always pack a bunch of snacks for the family. It saves time on food stops. All what you have listed are great! There are some things when you are in a rush you simply don’t think about. Awesome list to have handy. We always try to utilize those rest stops of we can! They can let everyone at least stretch their legs. Preparing with entertainment is definitely important. I can say that one time we forgot it for the kids. Horrible! Oh all such wonderful ideas! I love your Rainbow Kit! I have to make those for our next road trip! And..we have to try their pizza! Looks so good!